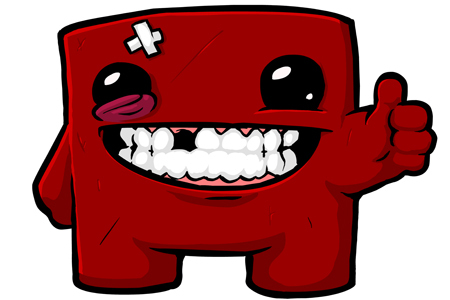 Super Meat Boy is a platformer about a boy without skin named Meat Boy who must save his girlfriend, Bandage Girl, from Dr. Fetus. Aside from having the best story ever it’s also hard. Very, very hard. I’ve died over 3,000 times (which isn’t an exaggeration, the game keeps tracks of deaths) and haven’t completed the game 100% yet. But just because it’s hard doesn’t make it any less fun. The sense of accomplishment that comes with beating some of the harder stages is priceless, especially considering how easy some games are today. Game play is fairly simple. You navigate Meat Boy to Bandage girl at the end of each level while dodging all kinds of spikes, lava, bottomless pits, rotating/flying saw blades, salt (which instantly kills meat, obviously), rockets, globs of purple goo, lasers, deadly piles of (used?) syringes and about a million other different death traps I can’t remember. Wall jumping is a staple of the game with nearly every level having you jumping up vertical shafts at one point or another. The abundance of instant death obstacles means you’re going to die, a lot. But death isn’t treated so much as a punishment but more as a learning experience. If you die, you instantly restart at the beginning of the level, ready to try again. The key to getting through the game is learning how to precisely control Meat Boy, with levels boiling down to memorization of timing and what path to take. Super Meat Boy is broken up into roughly 350 stages spread across several different chapters. You start each chapter playing through the light world levels. If you beat the par time (get an “A+”) on a given level you unlock the dark world version of that level which is generally a much more difficult version of the original. Additionally there are tons of warp zones spread throughout the light and dark world. These warp zones each feature 3 different levels and, to make things just a bit more difficult, you only have 3 lives per level in warp zones. Then, there are special warp zones where you can unlock new playable characters. On top of all that, each chapter has a special “glitch” level, unlocked randomly if you reach Bandage Girl and she’s “glitching” like would sometimes happen when trying to play NES games (the blocky textures flashing and displayed in random patterns on the screen). Oh…and there are bandages on some of the levels which you can collect to unlock even more playable characters.